This fully original, solid silver, server measures 9" long and weighs 2.4 T. oz. It is in the form of a tomato server, but larger than that item (7 3/4" long in this pattern). The pattern is Alvin's "Raleigh," issued in 1900. It is a fancy bead and scroll design, with an upturned handle end. Price for the set of eight. Each of these eight, matching forks, measures 7 3/16" long, while the group weighs a substantial 11.6 T. oz. 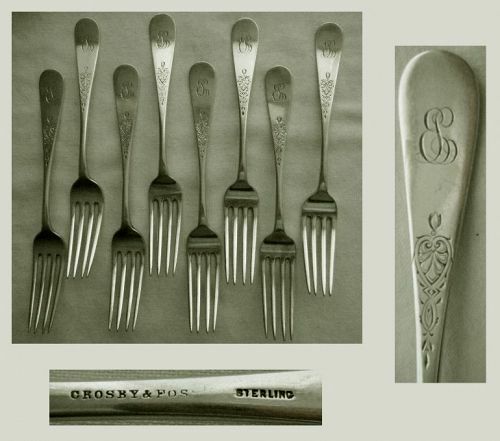 Marked "Sterling," they were retailed by Boston's Crosby & Morse (1864-69) and carry forward some of the design sensibilities of earlier coin silver flatware. Dating to the mid 20th century (1952), this 7 1/2" long, weighty at 2.0 T. 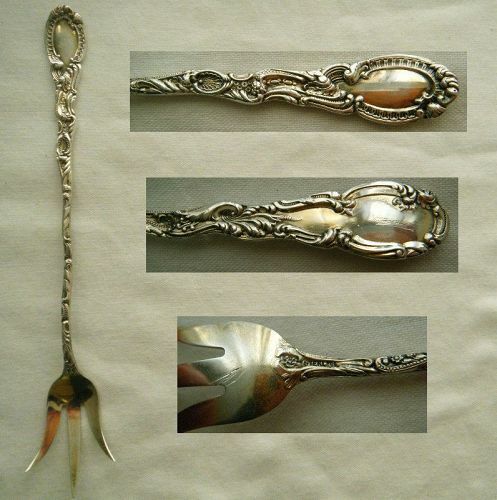 oz., fork is fully hallmarked for the year, sterling, and maker, "Worcester Silver Company," London, England. While a relatively contemporary piece, the scrolled terminal pattern, "Onslow," is an older English design, and the three tine configuration also harkens to an earlier period, all defining this as a reproduction piece. 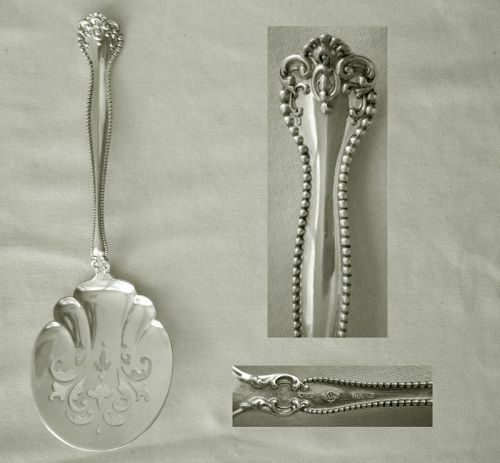 A matched set, these six, 5 3/4" long teaspoons have special attributes. First, they are exceptionally fine, extra weight, 5.9 T. oz. the group, examples of Wood & Hughes' Moorish or similar, Renaissance Revival, "Venetian" pattern. An 8 3/8" long item, this lettuce fork is heavy, weighing 2.0 T. oz. The pattern is Dominick & Haff's "Renaissance," which features images of Florentine style, bearded figures on the end of the handle and the backside heel of the bowl. This example, retailed by Boston's "Bigelow, Kennard & Co.," as indicated on the handle reverse, along with the D&H three part emblem, the word "Sterling," and "Pat-d. 94.," is the pierced version of this pattern. Measuring 7 3/8" long and weighing 1.7 T. oz., this sterling silver sugar sifter is a fine example of quality 18th century English silversmithing. A multi-motif floral design dating from 1887, Towle "Orchids" reflects Aesthetic influences in its dense, low relief, design. This example is a 7 1/8" long, substantial weight at 1.7 T. oz., preserve or jelly spoon. It has a decorative bowl, with scalloped shoulders and a swirling design in the interior, which is engraved in a flower and leaf motif that matches the overall pattern. The matte surface retains a portion of its original pale gold finish. A large item, this piece measures 10 13/16" long and weighs just over 3.3 T. oz. 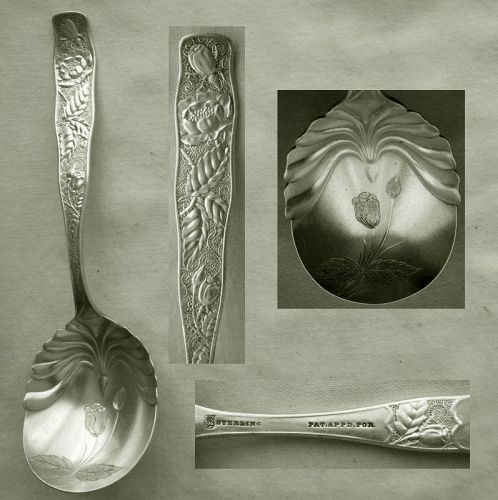 It is a solid silver ice cream slice or knife in Frank Smith's "Newport Shell" pattern, which features a shell end handle with beaded border on the front, and double lined edges and the shell crest on the backside. A large item at 9 1/8" long overall, and weighing over 2.5 T. oz., this spoon has a generously sized, plum shaped, bowl that measures 3 3/4" by 2 1/2" at the widest, and 1/2" deep. It reflects a form that saw various expressions in the mid 1860s. The common characteristics of this style are a faceted, which this is, or tubular stem, surmounted by any number of ends, for example, knob, ball, sphere, cube, or as in this instance, "dome." Relatively large, this inkwell stands 4 1/8" high and has a base diameter of 2 3/4". The body is brilliant period cut glass with a 1/2" wide silver band around the bottom, and with a silver collar and spherical cap. It also has a steel rod that makes up nearly two-thirds of the total length of the piece. This is six-sided and pointed. It appears to be a skewer although it is often identified as a sharpener or hone. Typically, however, these latter were rounded and had knurled surfaces. An exceptionally large, all silver, item, this piece measures 12 1/4" long and weighs 4.2 T. oz. 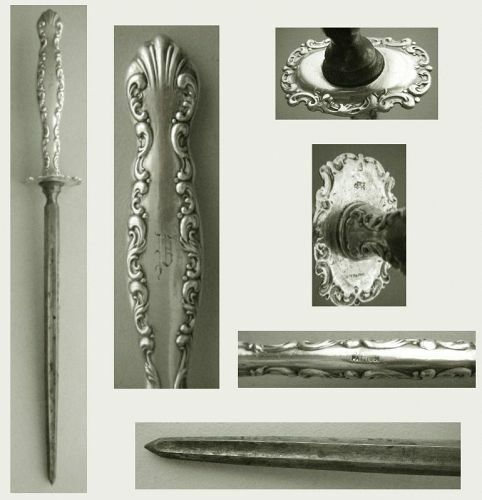 Made by Gorham, whose "lion, anchor, G" hallmark, along with "Sterling" and the model number "B698" are imprinted on one edge, and the name of the retailer, Boston's "Bigelow, Kennard & Co." on another edge, it is commonly identified as a page turner or letter opener, but catalogues of its circa 1900 period, label it a paper cutter.